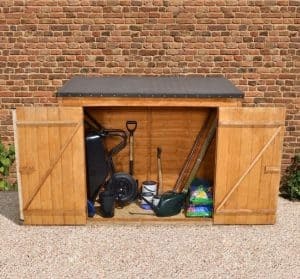 The 6′ x 3′ Store-Plus Overlap Maxi Wall Storage Shed is an amazing way to add some extra storage and it has a compact design so that it will be perfect for a garden with very little space. This neat design though still has a very good amount of storage space on the inside for you to keep things like your lawn mower, tools, gardening items and perhaps even all of the children’s garden toys safe from the rain and off the lawn. The shed has a very modern look which will allow it to easily blend into any style of garden and be there for you to make use of for many, many years. The best news? Iit does all of this at a very low price. Even though this is incredibly reasonably priced it is still made with some of the finest materials. European softwood is used throughout and the overlap cladding is on a very strong and sturdy frame to make this one very durable structure. This cladding along with the high quality felt covered pent roof will not allow any rain to get inside. To make getting things in and out of the shed a hassle free experience the shed has two very large double doors which as well as serving a practical purpose also have a great look to them. 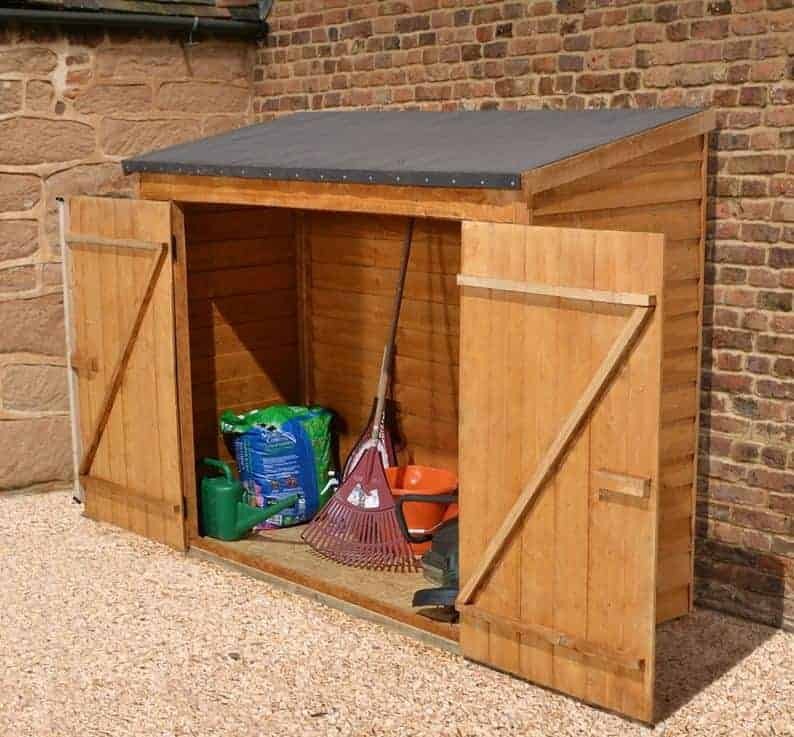 Here we have a truly fantastic shed that is compact in its overall size so that it can fit into a garden that lacks space, but at the same time it does actually give you a good amount of room inside to keep things out of the rain and safe. The 6′ x 3′ Store-Plus Overlap Maxi Wall Storage Shed has a very reasonable 6 feet of width along with 2 feet 7 inches of depth. It may not sound huge, but when you have this space staring back at you, you will be amazed at how large it seems. With some clever planning and placement of your items, you can really make great use of the space on offer here. The highest point is at the back and this is 5 feet 1 inch, and at the front there is 4 feet 7 inch. This we feel is not the tallest by any means, but it should be enough headroom to be able to get in and grab what you need without it being too uncomfortable. For the roof, Store-Plus have made fantastic use of a classic, pent style roof. This will certainly keep your things inside safe from the rain. The roof is made from solid sterling board and is a good 8 mm thick to ensure it is strong enough to handle even the heaviest of snow. Covering the boards we have some heavy duty felt which looks good and will last for many years. Store-Plus have gone with some very traditional looking overlap cladding here and we really do love the way that it looks. It gives the shed such a pleasant and friendly look that at first you do not realise just how strong and reliable it actually is. This cladding is 8 mm thick and made from European softwood. It will do an amazing job making sure no rain will get inside and it will also be up to the challenge of dealing with kids banging into it or kicking a ball of it. For the frame we are very impressed with how Store-Plus have managed to make use of a solid, 28 x 28 mm frame to make sure that lovely cladding stays firm for lots of years. The frame is made from the same kind of wood as the rest of the shed and we could not be any more pleased with how sturdy it feels. It does give the structure just an excellent backbone to ensure that it will last many years and not become weak. Sterling board is what has been used for the flooring and it is the same 8 mm thick style of board which has been used for the roof. We like these boards as they are strong, but they do not push the price of the shed up. To really help the stability and strength of the floor, pressure treated floor joists have been used. This means that you can really put some weight on this floor and it is going to be able to take it with ease. Before the shed is delivered it will be dip treated which is great and it does give it a good start. 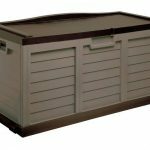 But to ensure you have a shed that is going to last for a lot of years and also keep looking good, you are going to want to use some wood treatment and give it a coating once per year. We actually recommend that you do this for the first time as soon as you have built it, after a cup of tea of course. 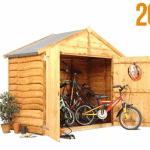 Store-Plus offer an incredible 10 year anti rot guarantee with this shed. In order to benefit from it though, you must make sure you have used wood treatment as this is required for the warranty to be valid. The doors are amazing and will make it so storing things and getting them out again is not going to involve you having to twist and turn them in order to get them through the doors. The shed has large double doors which when fully open will give you 3 feet 11 inches of width and 4 feet 5 inches of height. This makes getting something as awkwardly shaped as a lawn mower inside and out again with no trouble at all. Each door has two large black door hinges which actually have a nice look to them, but they are also strong enough so that the doors will never start to move or sag at all. There are no windows, but as this is such a low cost shed we feel that adding a window would be unnecessary from a looks point of view, as well as adding to the price of the shed. This is very solid and it will offer you a lot of security. 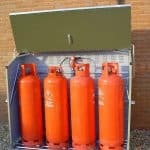 The materials used are very sturdy and a great defence against the bad weather. Add to this those large double doors that have a hasp and staple as well as two butterfly catches and you have a shed that is very secure when the doors are shut. It is very easy to add a padlock if you want to make things even more locked up tight. When the doors are closed this is a shed that offers you a lot of privacy. The lack of windows actually are a huge bonus in this regard as there is no way for someone to peek and see what you have stored in here. Customising the 6′ x 3′ Store-Plus Overlap Maxi Wall Storage Shed is very easy and something that would actually be practical as well. 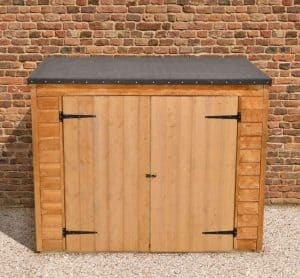 There are a number of different colours of wood treatment out there which will allow you to paint the shed in a colour that will make it fit in with the rest of your garden, but at the same time also protect it. 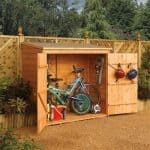 There are no extras available for the shed which when you think about it just makes it an even better deal, as apart from a padlock which can be bought for a pound, you get everything that you need. What a great shed this really is. We were very impressed with how despite the low price, this is such high quality. If you make sure to treat it after construction and once a year after, as well as being sure to take good care of the shed . We see no reason at all why this will not last you for a very long time. This is not a huge shed, but with 6 feet of width, you still can store a lot in here. We think that a couple of shelves on the wall would be a great way to add some extra storage space for very little money. 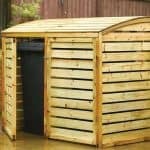 This would be a great shed for someone who is not too keen or skilled at DIY as by following the instructions, you and a friend can have this built in as little as a couple of hours. At under £150 we can honestly say that this shed offers amazing value for money and a great way to add some extra storage to your garden.